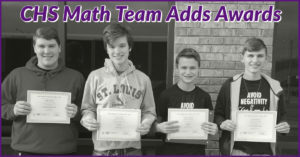 On March 19, 2019, the CHS Math Team participated in the SIUC Carbondale Math Field Day competition. There were 779 total students from across Southern Illinois who took the exam. Aidan Kaufman placed 2nd overall among all freshmen. Tyler Boener placed 5th overall among all sophomores. Jimmy Moore placed 2nd overall among all seniors. Kaufman and Moore won $50 cash prizes with their impressive results. “Now, we prepare for the state competition on Saturday, May 4th at U of I!” reports Coach Bill Gottschalk. You can support the team by participating in the “Trivia Night Like No Other” fundraiser on Saturday, March 30 at the First United Presbyterian Church in Collinsville. Doors open at 6 pm. Not as smart as a CHS mathlete? Don’t worry, cell phones are allowed during the timed rounds and Coach Gottschalk says there are questions for every level of knowledge. For complete information on Trivia Night Like No Other: click HERE.